Why not try this for a simple sunday meal or even a relaxed saturday meal? 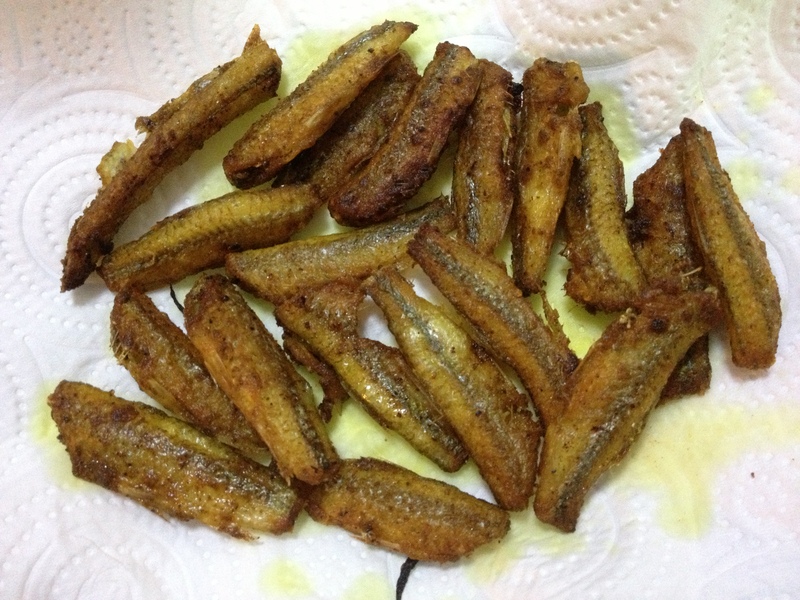 Steamed Rice – Thaalicha Paruppu with varutha meen – pan fried small fish and varutha kathirikkai – pan fried spicy eggplant! Here we get small river fish – which my daughter loves when pan fried… but when cooked in gravy, it is a tedious affair to remove bones. Especially with an inexperienced, recently converted non-vegetarian mother like me. The fish is very quick to make and so is the eggplant – ofcourse the eggplant needs some cutting but the fish – might have been moulded the right size straight from heaven! Coming to the platter – I just made Steamed Rice and Thaalicha Paruppu (quick-and-easy-thaalicha-paruppuseasoned-lentil) for the main course. 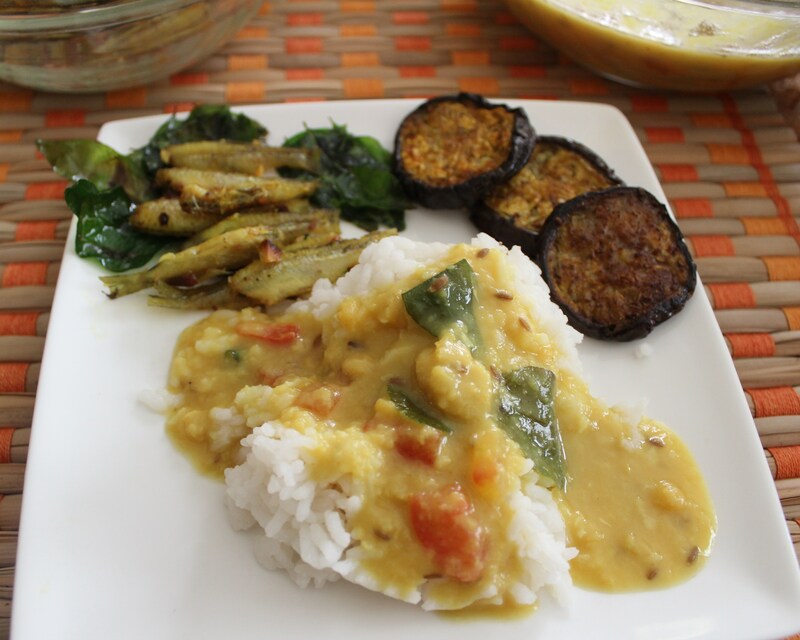 As south indians, we always mix up the rice with the lentil or any gravied curry. And compulsorily need a side dish – be it semi gravy kootu(stew of vegetables) or a dry vegetable to have with the mixed lentil and rice. Now enters the fish and eggplant as side dishes or accompaniment to the main course or the only course on a lazy weekend – lentil and rice. The marination can be an insult to true marination – as in the true sense, we sprinkle the spices and fry – but – a lazy day’s true treat – without doubt! 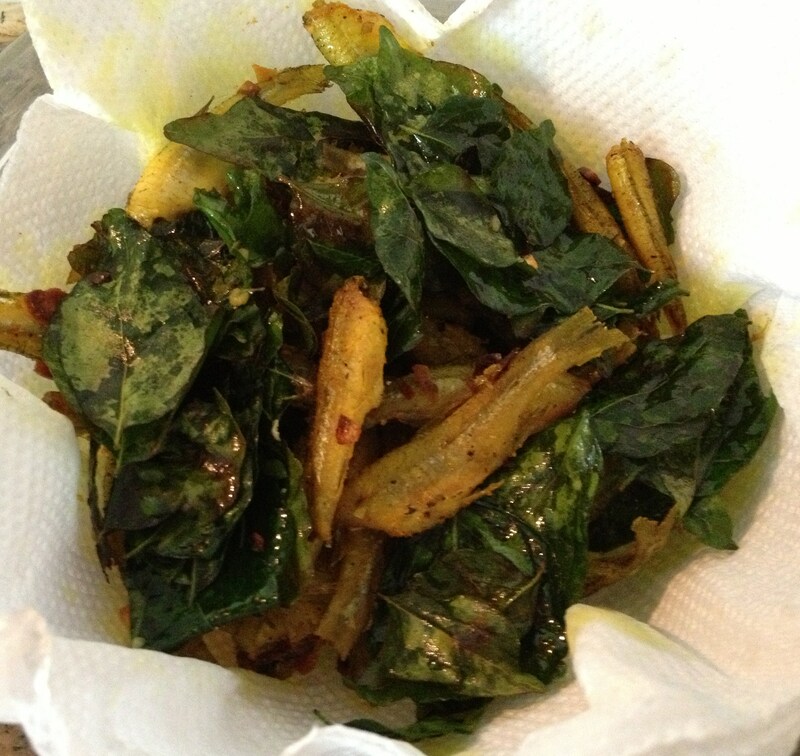 Garnish with the fried curry leaves. 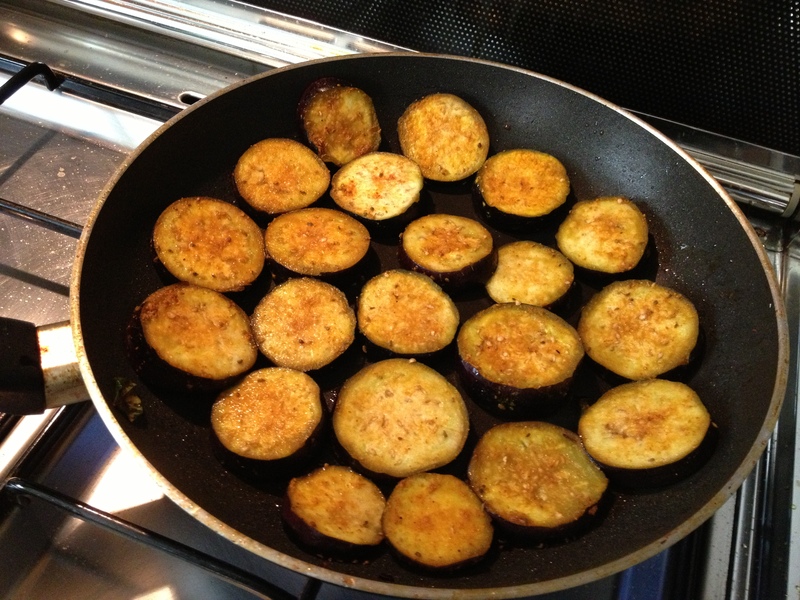 Eggplant is very low in calories and fats but rich in soluble fiber content. The peel or skin (deep blue/purple varieties) of aubergine has significant amounts of phenolic flavonoid phyto-chemicals called anthocyanins.Scientific studies have shown that these anti-oxidants have potential health effects against cancer, aging, inflammation, and neurological diseases. As usual heat oil in a pan and fry till done on both sides. 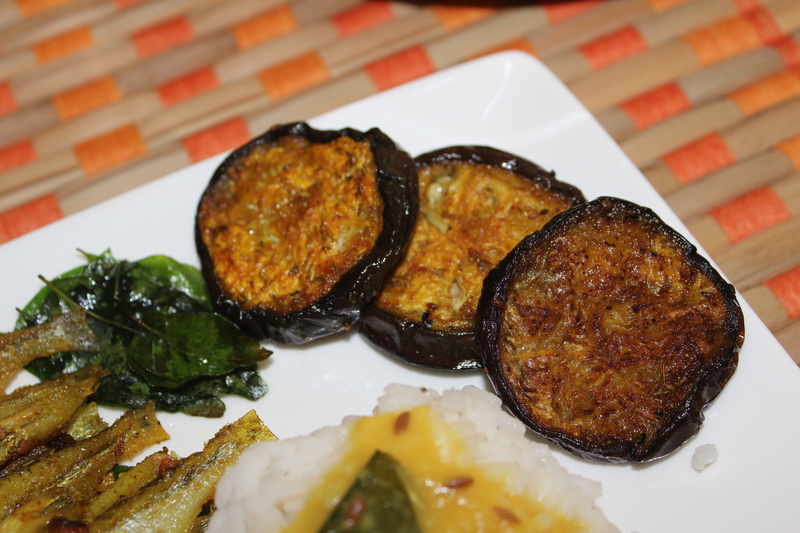 Serve fish and eggplant with steamed rice and thaalicha paruppu. There is always Yoghurt at home and that helps to end the day’s meal with thayir saadham – that is just plain yoghurt and rice! A dash of lemon juice while marinating gives a wonderful flavour in both; or just add after the fish is crisply done. Lemon juice after the eggplant doesn’t suit much though. 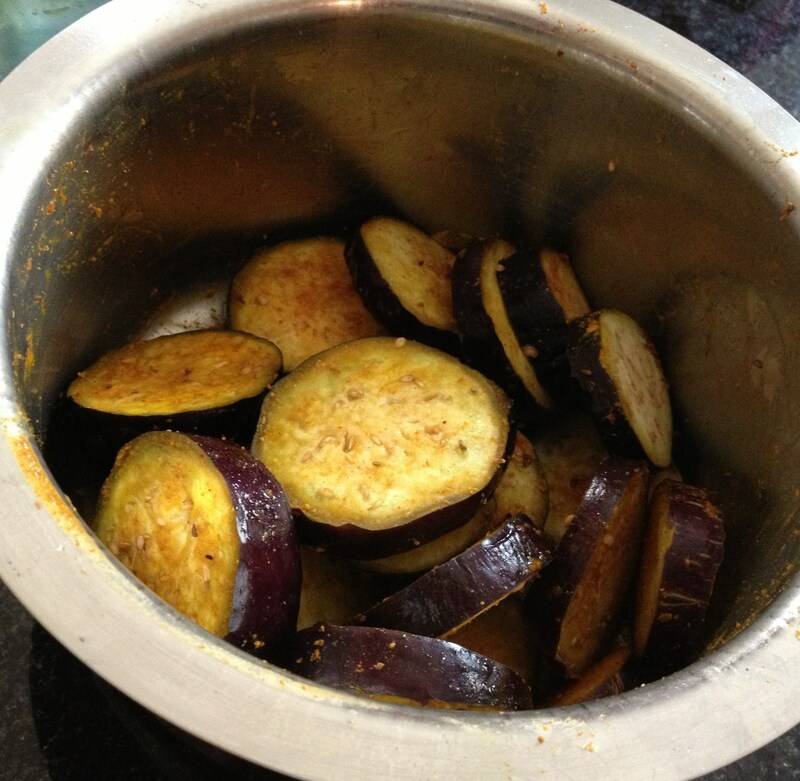 For marination of eggplant, sambar powder can also be used for even more lazier ladies (I do it sometimes)! Call it a Simple Sunday Meal and why two dishes? Do some of you feel this way – just opt one per week! Sometimes I feel guilty when my daughter asks why is there a lot of empty space in her plate….. in search of more side dishes! Now, with fish and eggplant her plate was not empty!! Why even cook the thaalicha paruppu/seasoned lentil? It happens my friend… tttooo lazy for anything. Take that Plain Yoghurt from the fridge… Have you cooked your rice atleast? Make Thayir Saadham/Curd Rice (thayir-saadham-mor-milagaicurd-rice-sun-dried-chillies) or just mix Rice and Plain Yoghurt on the lunch table. Enjoy with fish or eggplant!! A sumptuous meal and some rest too! Yes Kalai! nice to hear from you!